You may be familiar with pine nuts–the teardrop-shaped, delicious little nut that is often used in making pesto and in cooking of other dishes. 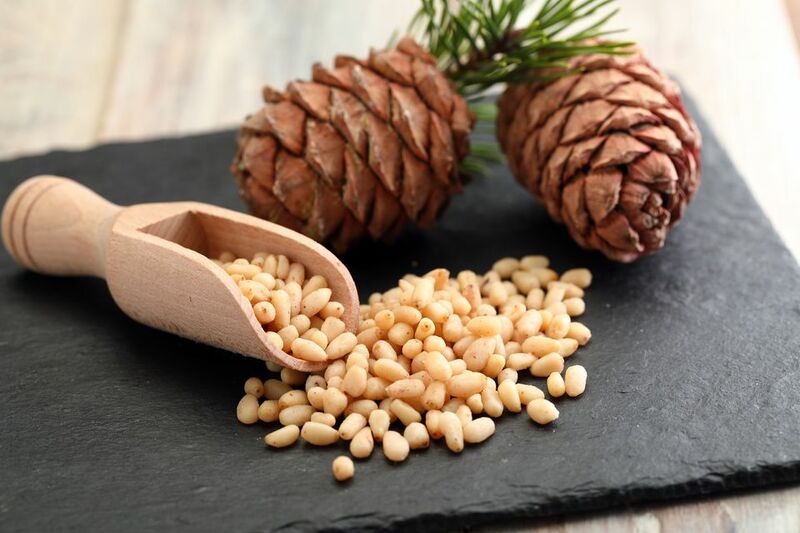 Pine nuts (also called pignoli) are the edible seeds of pine trees. Seeds and nuts are one and the same. Seeds are the inner, usually edible part of a hard, inedible nut casing. As for why pine nuts are one of the more expensive nuts on the market, the answer lies in the time required to grow the nuts and the effort to harvest the seeds from their protective encasement. Approximately 20 species of pine trees produce pine seeds that are large enough to harvest. The most commonly harvested seeds come from four particular pine tree varieties: the Mexican pinon (Pinus cembroides), the Colorado pinion (P. edulis), the Italian stone pine (P. pinea), and the Chinese nut pine (P. koraiensis). It takes anywhere from 15 to 25 years for the trees to begin producing the seeds and up to triple that time for them to reach top production. The majority of the North American harvest comes from wild, uncultivated trees. For the most part, the seeds are harvested by hand, a contributing factor to their expensive price tag. The pine seeds are found in the pine cones and take about 18 months to mature. Since the pine nuts are ready to harvest 10 days or so before the cone begins to open, they are very difficult to remove. To speed up and ease the process, the cones are placed in a burlap bag and left in the sun to dry for 20 days. Next, the cones are smashed, releasing the seeds, which are then separated from the cone by hand—a very time-consuming and patient-testing task. But wait—there’s more. The pine cone is not the only covering for the seed; each pine nut has a second shell which must be removed before eating. Some of these shells are thin and easy to take off whereas others are thicker and more challenging. All of the above factors contribute to the understandably high price of the pine nut. Pine nuts are small, elongated ivory-colored seeds measuring about 1/2 inch long. When raw, the seeds have a soft texture and a sweet, buttery flavor. They are often lightly toasted to bring out the flavor and to add a little crunch. Pine nuts are eaten by many cultures around the world and are known by many names. In the U.S., the most popular use is in pesto or as a crunchy salad topper, and they are also good for use in desserts and for adding a twist to hummus. As delicate and delicious as pine nuts are, they can have negative effects when eaten. Called “pine nut mouth” or “pine nut syndrome,” this condition means that simply eating pine nuts causes the other food you consume to have a metallic, bitter taste. Fortunately, this only lasts a few days and is believed to be caused by specific species of pine trees mainly found in China. And although pine nut allergies are real, they are a lot less common than other nut allergies.